Cee Lo Green is the Soul Machine. That's not just the name of his second album; there are fewer truer statements about the modern music industry. Whatever Cee Lo touches, he infuses his unique fusion of oldschool motown flavor and a down south grittiness that finds success no matter what genre he decides to funkify. Starting off with one of the original (and one of the best) rap groups of all time, Goodie Mobb (who coined the phrase "Dirty South") Cee Lo decided to pursue a solo track, making two of the most eclectic "hip hop" albums of the decade. With his two later albums with the producer Danger Mouse as the group Gnarls Barkley, Cee Lo took his eclectic nature to a new level, dabbling in a rainbow of various styles and influences, allowing them to cross pollinate, and in the end creating pretty extraordinary music. 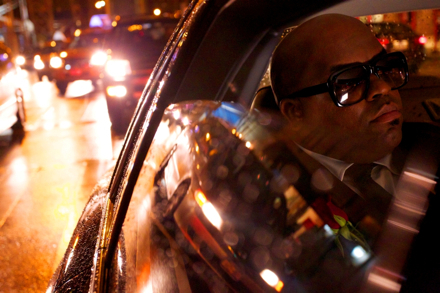 In his newest project, The Lady Killer, Cee Lo draws from his love of motown to create his most impassioned project to date. Filled with standouts,one my favorites is found at the tail end of the album. The album in itself is like a giant theatrical play about relationships, with different songs taking places of different acts, documenting the kaleidoscopic nature of the ups-and-downs of every relationship. On this jamandahalf, a cover of a Band of Horses song, Cee Lo takes the original by the Seatle indie band, and gives it a motown makeover-enrinching it with a soul smoothie, taking the slightly emo tint to the original, and flipping it into a full blown outburst of passion. Cee Lo Green does what Cee Lo Green does best: makes the song it into a Cee Lo Green track. And that's something we can all be thankful for.